Ah, camping. My husband and I used to camp a lot before we had kids. Now that I’m older (and I have a daughter who is not exactly an outdoorsy, low-maintenance type), I enjoy a day of nature, and then I’m all about a hot shower and a comfy bed. 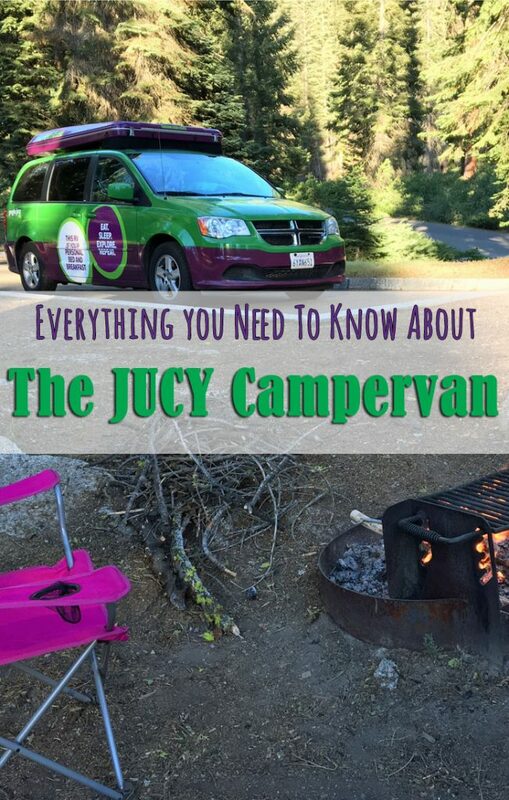 But when I read about the JUCY campervan, I was intrigued. I’ve always wanted to take an RV vacation, and JUCY seemed the perfect way to get my family’s feet wet. 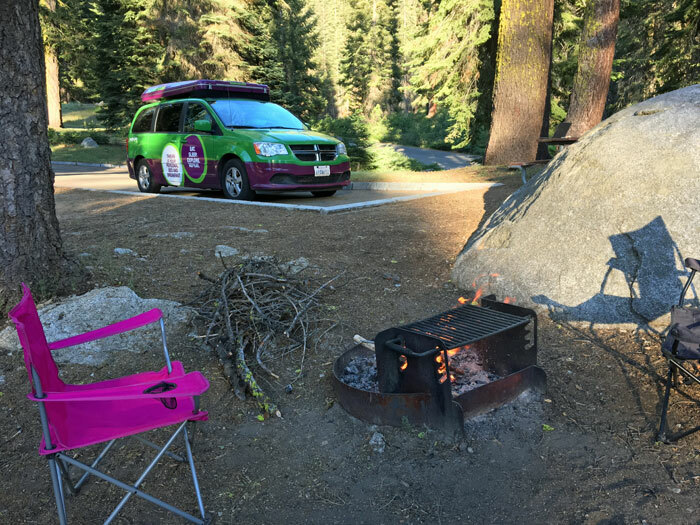 Camping in Sequoia National Park with the JUCY RV. JUCY was founded in New Zealand and is well-established there and in Australia. They have recently come to the US, with locations in Los Angeles, Las Vegas, and San Francisco. We picked up our JUCY Trailblazer in Los Angeles, camped in Sequoia and Kings Canyon National Parks, drove up to Lake Tahoe, and then dropped the RV in San Francisco. 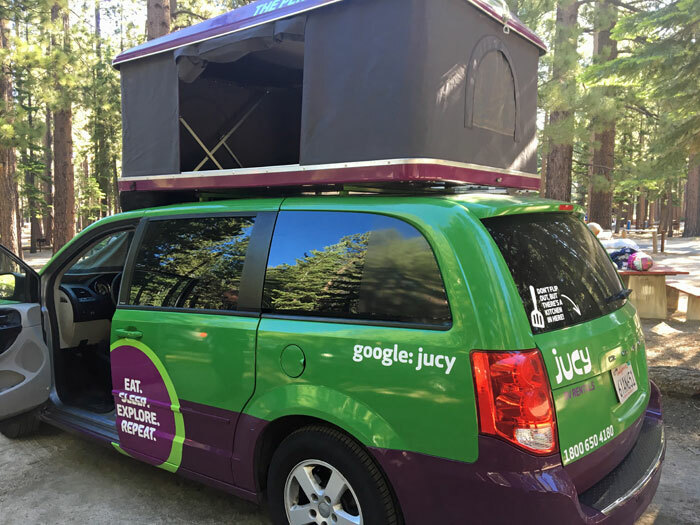 What is a JUCY RV? A JUCY is a mini RV, also called a campervan. It’s created from a Dodge Caravan minivan. The inside is equipped with seating for 5 (though that would be a really tight fit), cushions that lay flat to become a bed, and a small storage space. The back of the van is your kitchen – a refrigerator, stove, and storage space for dishes, pots and pans, and utensils. 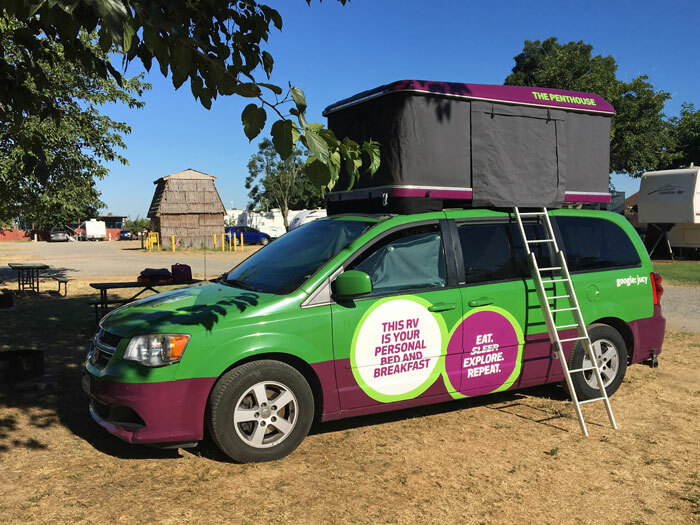 JUCY’s mission is to “give travelers the green light to have the time of their lives.” And their bright green and purple branded vans certainly attract attention. 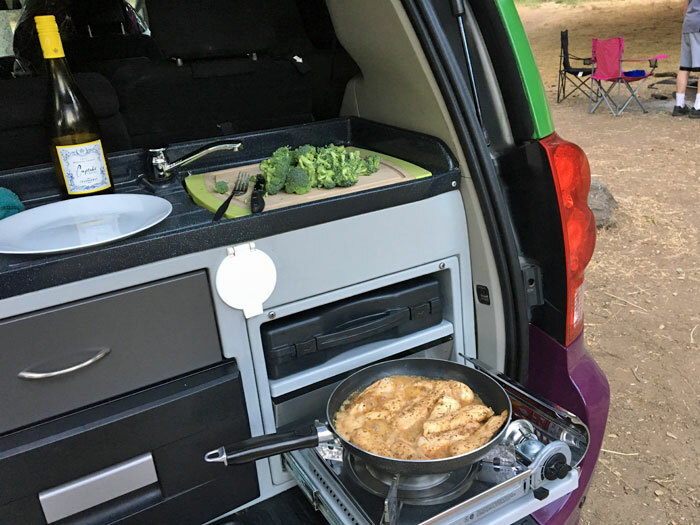 From tent campers and RV owners to people on the streets, everyone asked us about the JUCY RV. How many people does the JUCY sleep? The Trailblazer sleeps 4 people. Two sleep on top of the roof in “The Penthouse” – a comfortable, pop-up tent with a cushion inside. Two sleep inside the car in the backseat which converts to a sleeping area. That said, it may be a tight squeeze for 4 fully grown people. And it may even be a challenge for a family with two small children. But it’s not about sleeping space. The issue is simply space for your luggage and bedding. Tip: Try to pack light and bring sleeping bags to avoid storing heavy bedding while driving. You’ll see that our luggage, food, pillows, sheets and blankets are taking up a lot of space in the back of the van. There is enough room for my daughter, but if you have two kids or kids with car seats? It would be tight – unless you are really low-maintenance and can pack super light. For a shorter weekend adventure, luggage may not be an issue. If your child needs a car seat or booster, there is really nowhere to put it when the bed is down. You have to move the front seats all the way forward to set up the bed. It may be possible to put the car seat in the front by pushing it up between the dashboard and windshield, but I didn’t have a car seat to test it so I’m not certain. And you also need to put your luggage, food, and anything else up in the front when the bed is down. So you can see how it might be a challenge for a family of four to camp in the JUCY. My husband and I LOVED sleeping up in the Penthouse. It was comfortable, easy to pop-up, and well ventilated with screened windows that zipped open. My daughter was not so thrilled sleeping inside the car. If she was too hot, she had to open the windows. And then? Bugs in the car. Something to keep in mind if you’ll be camping when it’s really hot outside or in an area that has a lot of mosquitoes. How much luggage can you fit? This was a BIG question I had before our trip. Looking at the photos online and the layout of the van, I was really concerned about where we’d keep our luggage. 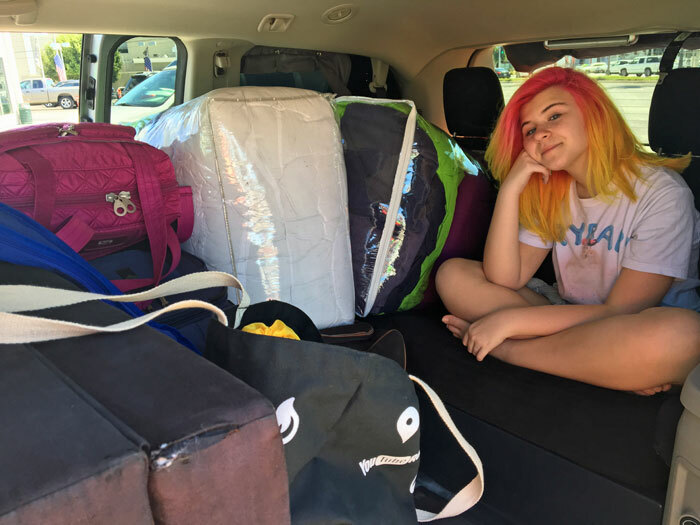 We were on a two-week trip that involved some hotel stays, a business conference, and then the camping, so we had to pack a bit more than the average camper. I searched online for some reviews of the JUCY and read someone recommended a duffel bag that could be “stuffed” into a space under the seat. So I loaded up our (way too big) duffel bag and hoped for the best! It didn’t work out as I had hoped. Our duffel bag was much too big to fit in the storage space, which was under the bed cushion. 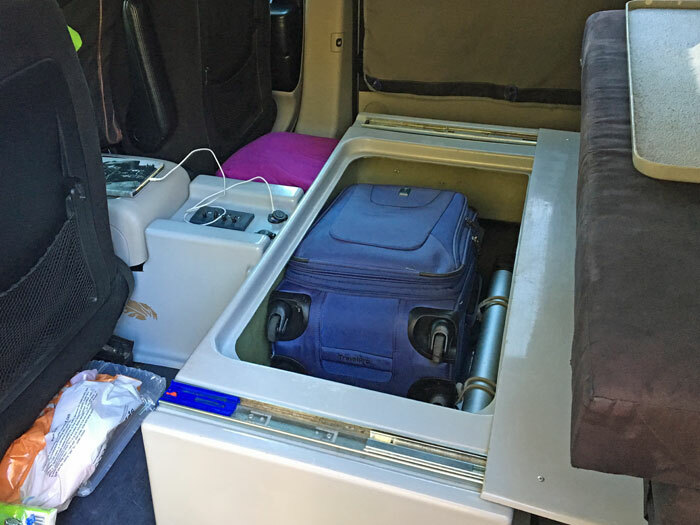 The space extends the width of the car, but it’s divided into two sections so you can only fit smaller pieces of luggage inside. I fit a carry-on and a second, smaller bag in the storage space. Our big duffel bag had to stay in the backseat with my daughter. And every night, we had to move the bag (and many other things) into the front seat to put the bed down. We stored a carry-on sized bag in the storage compartment, plus another small shopping bag. That was the only real inconvenience – moving everything to set up the bed each night. If you have only two people sleeping up on top, your luggage stays in the backseat and the JUCY is perfect. But adding in the third or fourth person made the sleeping set up a bit cumbersome. To get to the storage space, you lift the large bed cushion (which is rather unwieldy – I needed my husband to help me from the other side of the car), remove the top from the storage compartment, and access the storage space. This is not something you can do quickly or easily, and when the bed cushion is down flat, you can’t get to the space at all. So make sure whatever you put in there isn’t needed on a regular basis. My recommendation: Pack several small, soft bags. No hardshell suitcases and no big bags. If you can organize your packing into specific days, you can keep keep one or two small bags stowed in the storage area. Then when you’ve dirtied a few days of clothing, simply swap out the stowed bags and keep the dirty clothes packed away. There’s also the issue of the bedding. If you can bring your own sheets, pillows, and sleeping bags or thin blankets – do it. We weren’t able to bring our own since we were flying from New Jersey to L.A., so we rented the bedding set from JUCY for an additional fee. The JUCY bedding set comes in a huge bag with two towels, two sheets, two pillows, and a big, heavy comforter. It’s nice, but it takes up way too much space in the car. Since we had three people, we needed two of the bedding sets. Half our backseat was filled with bedding when we were driving. If you can bring just a sleeping bag and pillow, that would free up a lot of space! How long does the JUCY take to set up? Cranking up the Penthouse on top of the van takes about 2 minutes. Cranking it back down might take 3 minutes because you need to walk around and tuck in the fabric to make sure you get a tight seal. It’s super easy. We left our sheets and comforter up there and didn’t have any problem closing and locking the Penthouse. So that saved time setting up and space in the back seat. At the end of the day, all we had to do is get the crank from the glove box, unhook the latches, and crank it up. Then climb up with our pillows and go to sleep. Setting up the JUCY RV for sleeping. 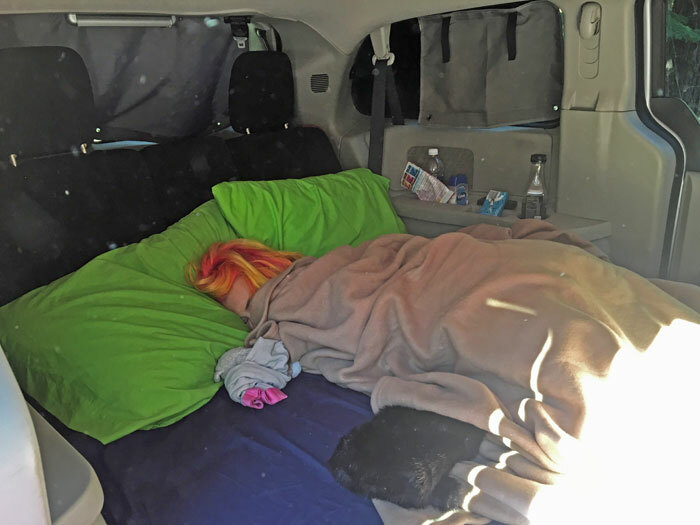 The sleeping area inside the car was more of a chore. First we had to move the driver and passenger seats all the way forward. Then move all our luggage, food, bedding, etc. out of the back seat. We were able to load most of it into the front seats, and some smaller items fit in the space under the bed. Then fold down the bed cushion and put on the sheets and blankets. Finally, you had to cover all the windows with shades that stuck on with suction cups. I wouldn’t say it’s difficult, it was just a process. Lots of moving things around every night and every morning. But still easier (and more comfortable) than setting up and breaking down a tent and sleeping on the ground. Sleeping in the back of the JUCY RV. How much fits in the JUCY kitchen and refrigerator? When we first stopped at a grocery store, I was concerned about how much cold food would fit in the refrigerator. It looks small, but it’s deceiving. As you can see from the photo, we fit a good amount of food in there. Quart of milk, bottle of wine, grapes, apples, peaches, broccoli, chicken, and chocolate. You can easily fit enough food in there for 2-3 small family meals. So you will want to be sure to have access to shopping every few days, or rely more on non-perishable foods. 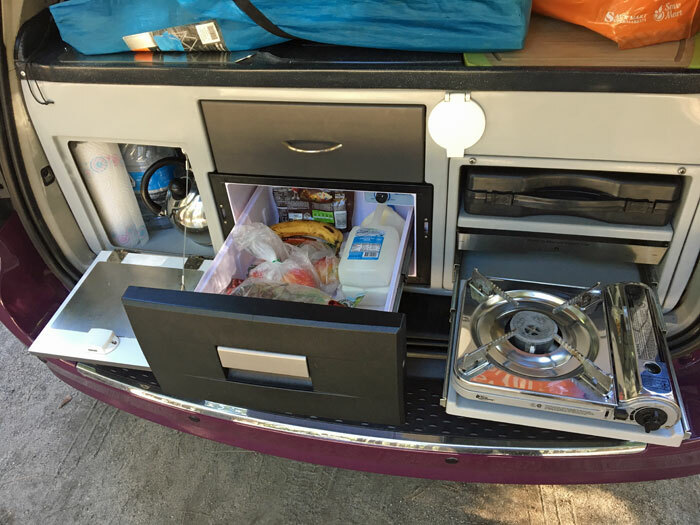 The kitchen of the JUCY RV. It worked out great for us since we were moving to a new campground each night. One day, we ate breakfast at a diner, then saved our leftovers of toast and hashbrowns to warm up on the stove the next morning. For dinner, we purchased pre-marinated chicken (since we didn’t have any spices with us) and wine to cook it in (so we wouldn’t need to buy a bottle of oil). Since we flew to California, we couldn’t bring much with us. If you are renting the JUCY from near your home, you can pack a lot more of your own food and cooking needs. Cooking chicken & broccoli in the JUCY campervan kitchen. JUCY will provide cups, bowls, plates, and cutlery for four, plus cooking utensils, a tea kettle, and pots/pans for an additional fee. It’s a flip of a switch to light the butane stove, and I found the cooking experience to be simple and convenient. We experienced one problem with our JUCY – we weren’t able to get the water to come out of the faucet. JUCY fills the water tank before you pick up the van, and it’s easy to refill when you need more. You pump the faucet to get water, and the waste water drains into a holding tank. Then you empty the waste water in an appropriate area. We tried pumping the faucet many times, but didn’t get any water. JUCY provides an 800 number you can call for service, but we decided not to call. I’m not sure if our water tank wasn’t filled, or if something wasn’t working properly. But we decided it wasn’t a big deal. Every campground had easy access to water and a place to wash dishes. It was just easier for us. What does a JUCY RV cost? Depending on the time of year and location of pick-up/drop-off, the Trailblazer will cost you $75 – $125 per night. Considering you are getting a rental car and accommodations in one package, this is a great deal. Mileage: You can pay 25 cents per mile, or buy a pre-paid package of 100, 500, or unlimited miles. Unlimited is $25/day. Insurance: You can buy optional insurance coverage for $10 – $35 per day. Kitchen kit: Rent cooking equipment and utensils at a fixed cost of $115. Bedding kit: Sheets, towels, comforter and pillows for 2 people is $50. JUCY also offers several options for winter camping, such as snow chains for tires, heater, sub-zero sleeping bag, and more. You can also rent child seats, additional butane gas cans for the stove, AUX cables, USB cables, or a GPS. As an example, we got the Trailblazer with unlimited miles, the kitchen kit, two camping chairs and two bedding sets. Our cost would have been $850 for a six-day loan. JUCY generously provided the Trailblazer free of charge to facilitate this review. We also helped them relocate the vehicle from Los Angeles to San Francisco. Our cost to stay at campgrounds each night varied between $20-$40. The total cost of our trip (transportation and accommodation only) would have been approximately $1,000 for a six-night vacation. And how about gas mileage? The JUCY campervan got us about 17 mpg. The average RV gets 5-15 mpg, depending on size. I think a JUCY RV is an ideal solution for a couple looking for an easy camping adventure. If you can pick up the van and load up with your own camping gear, you’ll save a lot of money. 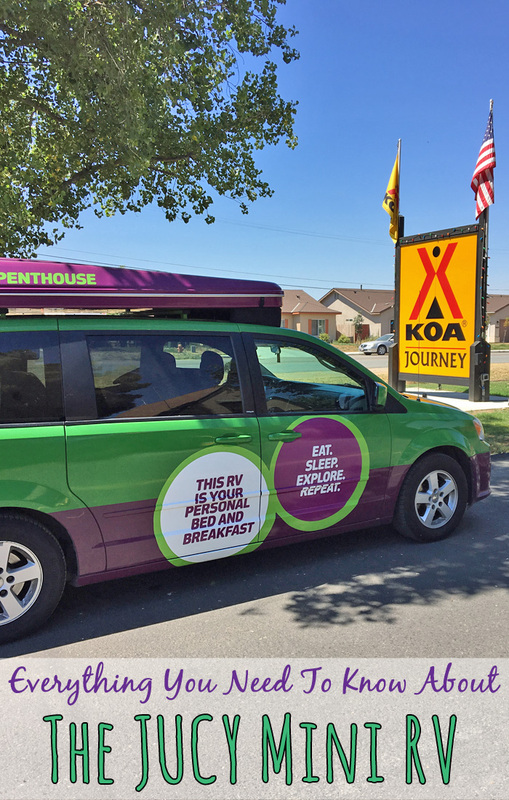 But even if you fly into L.A., San Fran, or Las Vegas and rent all the amenities from JUCY, it’s still a relatively inexpensive way to take an epic road trip! I didn’t know they also have a location in the States now, defenitly something to keep in mind. Love your honoust opinion! Thank you! It’s really a great option for a couple!